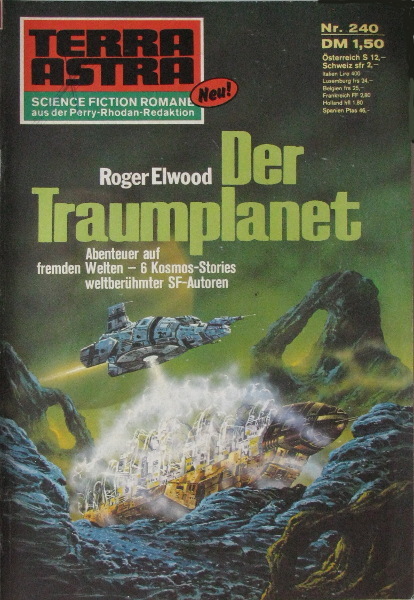 First German edition ("Neu!" stated on the cover). Abridged: four shortfictions and the introduction are omitted. Apparent first (and likely only) printing. "März 1976" stated in the copyright section on p. 65. Day of publication from weekly publication; this publication and Perry Rhodan #761 also share the same ads on their respective p. 2 & their inside bc & bc. Attention: the page count begins with the cover and the pub. has no ISBN, since it was not available in regular book shops. The table of contents appears on p. 5 and precedes the first shortfiction. No credit for the cover art, no visible signature, but Themistokles Kanellakis is credited for taking over cover art from Jones in #589 of the pub. series (and this piece of art matches Jones' style). Other prices: S 12.00 (Austria), Fr 2.00 (Switzerland), Lire 400 (Italy), frs 24.00 (Belgium), frs 25.00 (Luxemburg), FF 2.80 (France), hfl 1.80 (Netherlands), Pts 46.00 (Spain).